Find hotel near Botanischer Garten Chemni .. 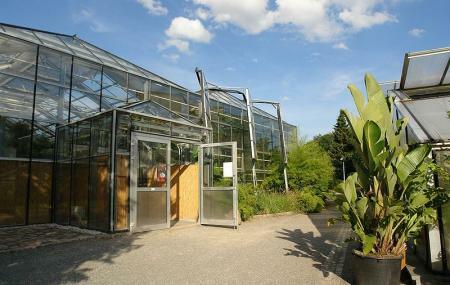 The Botanischer Garten Chemnitz are municipal botanical garden that are spread over 12 hectares of land and are located along the Leipziger street in Chemnitz. Originally built in the year 1898, the garden was extended in the following years. The garden was badly damaged during the World War 2 but was restored later. Between 1998 and 2002, new greenhouses were built here boasting newer plants. Botanischer Garten Chemnitz contains many outdoor areas that feature Central European habitats and 20 different forest communities. Featuring a wide collection of medicinal, aromatic, and annual and perennial flowers, this garden is home to 800 species of plants that includes cacti and succulents, carnivorous plants, pineapples, banana, coffee, manioc, vanilla, oranges, rattan, taro, and sisal among many others. A café and a restaurant are located inside the garden. How popular is Botanischer Garten Chemnitz? People normally club together Sachsisches Industriemuseum and Powerhall while planning their visit to Botanischer Garten Chemnitz. The inner gardens are interesting with big variety of tropical plants and plants from Latin America. The outdoor place looks normal but im not a big fan of seeing birds in cages. You can take a walk to the forest direct from there which is very beautiful. This has many more animals than we were expecting for a small municipal botanical garden and for free entry it is impressively kept and designed. We enjoyed walking in the woods behind too. Einfach wunderschön für unsere Kinder. Sehr kreativ und voller Hingabe gestaltet!!! So etwas darf in unser Stadt nicht untergehen!!! Dafür leben wir Chemnitzer hier! Solche Projekten muss unsere Bürgermeisterin weiterhin unterstützen und es sollte auch in den Schulunterricht eingebracht werden. Genau so das Wildgatter in Rabenstein!!! Vor Ort lernt man viele Dinge wie Blume Pflanzen und Tiere und deren Lebensbedingungen besser kennen!!!! Jede Schule in Chemnitz sollte sich daran beteiligen und lernen was es bedeutet mit Tieren und Pflanzen umzugehen, sie kennen zu lernen und auch zu pflegen!